Today’s 9 am Memorial Day ceremony by the Northfield Area Veterans will again be at the site of the Veterans Memorial in Riverside Lions Park. 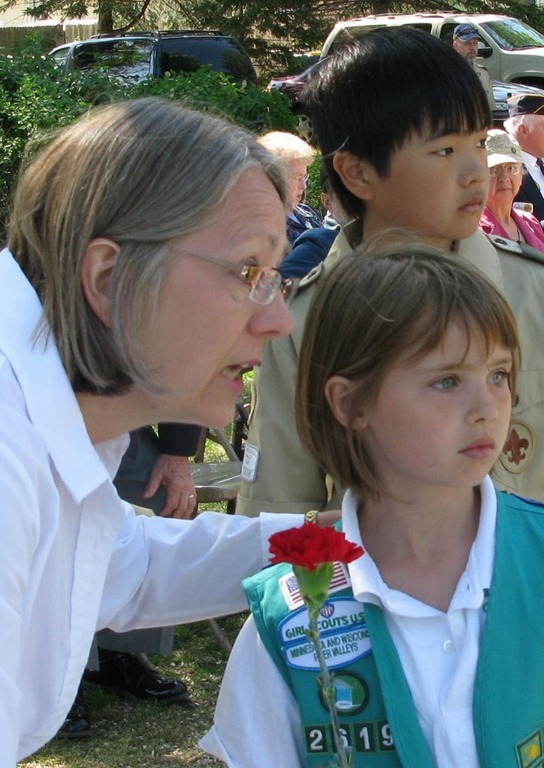 Left: a photo from last year’s ceremony: Pam Peterson with a Boy Scout and Girl Scout. The Scouts do the ‘placing of the flowers.’ Right: the thumbnail of my photo of the Veterans ceremony ad in the Northfield News for details. Click it once to enlarge, then click the green arrow to enlarge further. See my Memorial Day ceremony photo albums from 2009 (here and here), 2008, and 2007 as well as the dedication of the Northfield Area Veterans Memorial in November of 2005. And see the Veterans commemorative plaque and flag pole at Old Memorial Park. Griff: I’ve posted a brief story about this year’s ceremony on Northfield.org, but I’m looking forward to more and better photographs from you. Link your photos/story in the comments to my story, or let me know when your story is up, and I’ll link to it. Thanks, Griff! .-= (Rob Hardy is a blogger. See a recent post titled Recommended Poet: Alexandra Teague) =-. Rob, I’ve got a new blog post up of the photo album from this morning, with a link to your story. 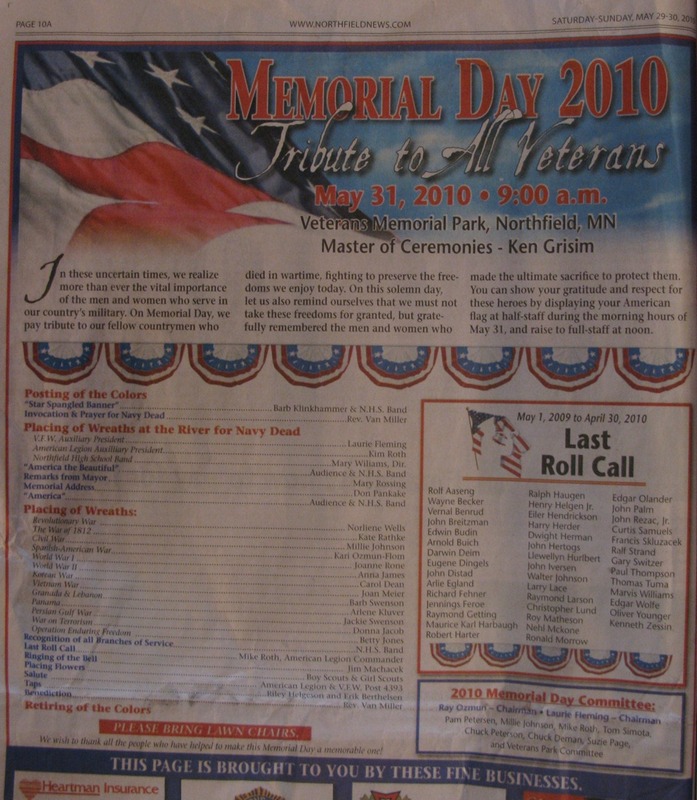 Thanks much for your post, especially for the listing of veterans who died in the past year.